iMetal Resources is aggressively exploring for Gold, Copper and Cobalt on very prospective ground in Gowganda, Ontario, Canada. With 105 sq. km, gold values of up to 56 g/t Au has been obtained, located next to Tahoe Resources 4 million ounces Gold deposit. Management thinks of iMetal as a company “On a Mission of Discovery.” Its Mission Statement is to discover new mineral deposits, primarily in the mining-friendly Province of Ontario, Canada. The 105 sq. 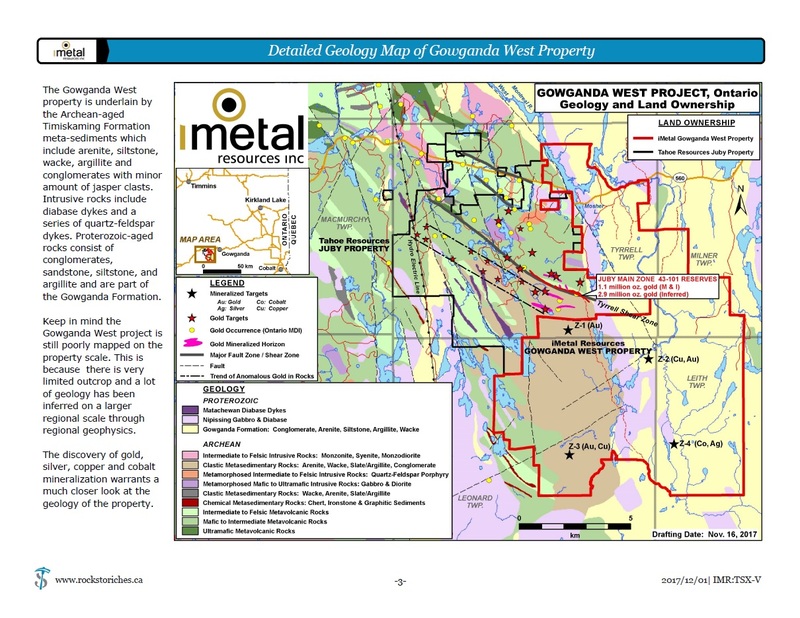 km Gowganda West Project lies 17 km southwest of the small town of Gowganda and 90 km southwest of Kirkland Lake, contiguous to Tahoe Resources' Juby gold deposit. The Gowganda West Project is situated within the traditional territories of the MFN-TFN/TAA (Matachewan First Nation/Mattagami First Nation (MFN) and Temagami First Nation/Teme-Augama Anishnabai (TFN/TAA)), and is located in an area with a long history of exploration and mining. The Gowganda West property hosts the projected eastward extension of the structural trend that hosts the Juby deposit. In addition, iMetal has discovered at least four additional mineralized zones on associated, but different structural trends that may represent splays off of the main trend. This is a common occurrence that is seen in structurally controlled gold and base metal deposits found in the nearby famous Kirkland Lake and Timmins mining camps. To date, IMR has discovered seven previously unrecognized mineralized zones on this under-explored property. The three most promising zones discovered to date have been dubbed Z1, Z3, and Z4. 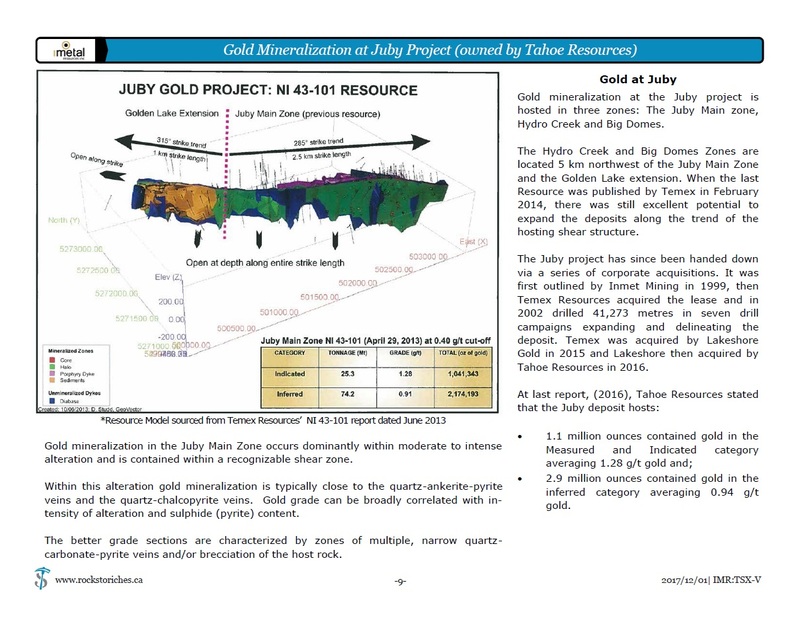 Z1: Gold mineralization similar to Juby deposit – has been traced to the north boundary of iMetals' Gowganda West Claim Block and mirrors Tahoe Resources' Juby gold deposit which is situated just a few hundred metres further north. Prospecting defined a shear structure that trends North/South and has been initially defined over a length of 300 metres with a width up to 20 metres. Z3: High Grade Gold/Copper target – is located 5.2 km south of Z1 and sampling yielded some high-grade gold and copper results. On April 23, 2018, iMetal announced that prospecting in the vicinity of Zone 3A has expanded the high-grade gold-copper quartz vein stockwork for 70 meters towards Zone 3B. The vein system consists of up to 2-meter-wide veins. Additional historic trenches discovered in the area provide additional evidence for the extension of Zone 3A stockwork towards Zone 3B for at least 300 meters. Mineralization in the stockwork is consistent and characterized by disseminated chalcopyrite with malachite stain and pyrite. Gold and copper assays from channel samples collected from the extension have maximum values of up to 10.71g/Mt gold over 0.5 meters and 0.50% copper over 0.3-meters from eight samples. Z4: Cobalt Silver target – is located about 4 km to the east of Z3 and represents a highly prospective Cobalt-Silver area. An old mine shaft was discovered by the Company while staking this ground. Numerous trenches east of this historic mine shaft have been identified. In one of these trenches measuring 20 meters long, the wall rock of the trench shows abundant “cobalt bloom.” This pinkish hydrated cobalt arsenate is often a guide to the presence of primary cobalt/silver ores. A chip sample of the wall rock assayed 0.01% cobalt. The discovery zones Z1 and Z3 underscore the precious and base metal potential on the Gowganda West property. Ongoing exploration including geophysical surveys and diamond drilling is planned for these two newly discovered target areas. iMetal has developed strong relationship with local First Nations. iMetal has signed Memorandums of Understanding (MOUs) with multiple First Nation communities (Matachewan First Nation/Mattagami First Nation (MFN) as well as Temagami First Nation/Teme-Augama Anishnabai (TFN/TAA)) to advance its Gowganda West Project. These agreements recognize the interests of the First Nations and create opportunities and potential economic benefits for both the First Nation communities and iMetal shareholders. Mr. Grandin is a well experienced mineral exploration financier and exploration company executive. Working with public companies for over 25-years, Mr. Grandin has a proven track record of raising venture capital as well as extensive expertise in corporate financial restructuring and capital markets. Through his past officer and director positions for various public issuers, he has the knowhow to streamline growth initiatives and increase shareholder value. Mr. Davis is a partner of Cross Davis & Company LLP Chartered Professional Accountants. His experience includes CFO positions of several companies listed on the TSX Venture Exchange and his past experience consists of senior management positions, including four years at Appleby as an Assistant Financial Controller. Ms. Murphy has been the Company's Corporate Secretary since 2004, having served in that capacity for several of the predecessor companies of iMetal Resources Inc.
Ms. Bezys is a geological consultant with over 30 years of varied experience in the international minerals industry. During Mr. Fedikow's 40+ year career he has worked for a variety of junior and major mining exploration companies. He has received the Provincial Geologists gold medal, Canadian national award for excellence in geosciences. Mr. Blanchard is a seasoned Digital Marketing executive. He is creating a digital platform that will enable iMetal to exponentially increase its ability to deliver its development story to the investment public. Mr. Dawson has been a Professional Consulting Geologist for over thirty years and a Director of Public Companies in the Mineral Resource Industry for over twenty years. Mr. Fagan has over 35-years of hands-on experience in all aspects of the mineral exploration sector and related securities business. Mr. Grabowski held the post of district geologist for the Ministry of Northern Development and Mines for more than 35 years, is currently a director of both the Northern Prospectors Association and the Ontario Prospectors Association. Mr. O'Connor has been active in the Ontario and Quebec mining scene from grass-rooted exploration to development to production for over 30 years. NEWS UPDATESOn June 15, 2018, iMetal Resources Inc. announced the appointment of renowned Northern Ontario geologist Gary Grabowski to its Advisory Board.On June 8, 2018, iMetal Resources Inc. announced that it has signed Memorandums of Understanding (MOUs) with multiple First Nation communities to advance its Gowganda West Gold-Copper-Cobalt Project in Northern Ontario. On August 28, 2018, iMetal Resources Inc. announced that it is moving ahead with the next stage of exploration at its 105-square-kilometre Gowganda West project following the receipt of multiyear drill permits from the Ontario Ministry of Mines and Development (MNDM). The Company can also now carry out planned mechanized stripping, trenching and ground-based geophysics over high-grade gold showing areas that continue intermittently for at least 2.4 kilometres along an apparent structural corridor (zones 3A, 3B and 3C). iMetal has immediately mobilized an excavator and its exploration team is on the property, led by exploration manager Tom O'Connor. On June 15, 2018, iMetal Resources Inc. announced the appointment of renowned Northern Ontario geologist Gary Grabowski to its Advisory Board. On June 8, 2018, iMetal Resources Inc. announced that it has signed Memorandums of Understanding (MOUs) with multiple First Nation communities to advance its Gowganda West Gold-Copper-Cobalt Project in Northern Ontario.